School started back this week--term 2. It's getting cooler during the day. We can go for mid morning runs. And the sports grounds are all ours! The other day the OP Pack noticed and remarked on Roxy's feet. Roxy's feet are unique to say the least. When she's resting, she turns out her right front leg at a funny angle. At times it look like it's on backwards. People always asked if she had rickets or if it was broken. As she was surrendered to the pound as a small puppy, we don't know if she had rickets. Could be, in a litter of 12 pups, maybe she didn't have growing room. She also has funny back feet. When SITTING, she sometimes has both out behind her, either straight as in this picture or crossed. Or, she rests on her toes. Usually, there is at least one leg flung out backwards. Getting her to SIT on command is a lottery--you never know what she'll do. She slowly lowers her back end into any one of her crazy positions. It is always a talking point wherever we go. The VET said it is just a Roxyism and to watch her weight as arthritis is a possibility in the future. it does not slow her down or hinder her in any way! We're showcasing our city's park today. It's Victoria Park and was the site of the ANZAC Day Celebrations yesterday. We were so excited--we tried to take off in different directions. There were new scents to investigate. Bella and Roxy decided the lush grass was the perfect place to poo. Roxy found something to pounce on in the rose garden. We dragged HERalong the path. We made the ducks get into the pond. We're posing in front of the Cenotaph (War Memorial). Then we headed back to the car. SHE said SHE is NEVER taking us there again because we tangled HER up in the leads; wouldn't stay still while SHE filled the poo bags and three retractable leads holding three exuberant dogs and camera were too much! We hope you like our park. We'd rather have gone to the river. 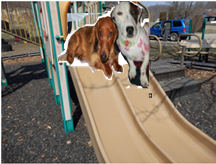 Oh, Roxy wants us to show the picture of her and Ernie taken at Ernie's favourite park. That's where they went when the squirrels hit the fan at the Ball. Today is ANZAC (Australian and New Zealand Army Corp) Day! It is the day to honour and remember all the men and women who have served our country in war--especially the fallen. It is a day where we remember the Gallipoli landing and 8-month battle in World War I.Though Gallipoli was a disaster from go to whoa, it is the was the first time Australia and New Zealand fought as their own countries and is viewed by both as defining the character of each nation--the ANZAC Spirit. It is not a time to glorify war--quite the opposite. Every city, town and village in Australia has a War Memorial and holds Sunrise Services followed by parades, and commerative services. The parades in the large cities can last up to 3 to 4 hours. These photos are of our city's parade today. Schools march--a good turnout as it is school holidays. The Returned Service men and women march, sometimes children march wearing the medals of their ancestors. Then everyone moves down to the Cenotaph for the official Services. After the official ceremonies, the diggers move to various venues to spend the day with their colleagues. There are official services held in Gallipoli, France and wherever service men and women in the world. We leave you with the words of Mustapha Kemal Ataturk--the first President of modern Turkey, who commanded the The Ottoman Turks--the enemy. "Those heroes that shed their blood and lost their lives...you are now lying in the soil of a friendly country. Therefore rest in peace. There is no difference between the Johnnies and the Mehmets to us, where they lie, side by side here in this country of ours. You, the mothers who sent their sons from faraway countries wipe away your tears. Your sons are now lying in our bosum and are in peace. After having lost their lives on this land, they have become our sons as well." Australia's population has just Officially reached 23 million people! This morning we went to the Park for a photo session. When we got back to our car, look what we saw! For a couple of weeks, the peeps at the Devil's Elbow had been talking about the lady who walks her dogs and sheep. The Akitas are nine-year old sisters....very sweet. Sampling the rose bushes in the Pool's car park. The sheep..well, large lambs, just walk along with them. They don't go into the road. Continuing towards the main part of town. If you've noticed the absence of two scotties and a spotty, we had to watch from the car! We were not allowed to meet them up close. Every morning about 6 and every evening around 6 the feral black cat goes to the house across the street to be fed. The peeps there feed the feral cats around town. We cannot believe it! We always yell at him. but I, Daisy, always stay on guard. They come back to yell at him when he finishes. Look, he's weeing in the other neighbour's garden. We can't believe it! So bold! It's getting cooler at night, so SHE got out our beds.....not that we use them much. Roxy thinks she OWNS the BIG bed. Somedoggy chewed the zipper off and got them all dirty. So SHE went to get us some new beds--in case we decide to use them. These were the ONLY ones that could go in the washing machine! Everything SHE looked at had to be hand washed! As you can see our bed covers have to be washed......frequently. These are thicker than the old ones, and bigger; though the photo doesn't show it. Bella thinks they look good; but smell funny. We may even sleep on them. Snack Time at the river, today. This morning--the day AFTER my real birthday, we went to the Devil's Elbow to play with our friends. SHE didn't take any photos because SHE says you've seen heaps already. We stayed for an hour and a half and ran around like crazy dogs. 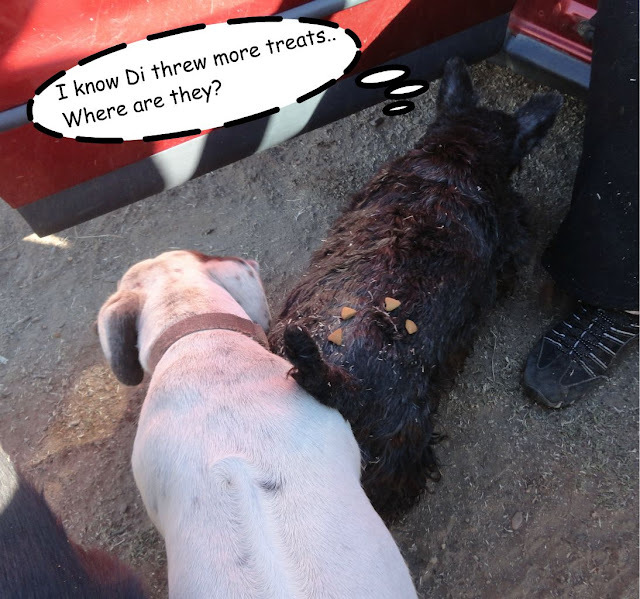 Afterward there were NO BATHS! We were surprised when we were loaded back in the car later and went to Sandy Beach, which is my (Bella's) favourite place. I swam, Roxy annoyed me, and Daisy investigated stuff. Can you see me out here? Roxy doesn't come out this far. Then I dug a hole in the sand, while Roxy annoyed me. And got covered in sand! to run and dry off. This picture was taken two days ago. We haven't seen these things in a while. It was BATHS when we got home, naturally and naps. That's supposed to be a 4 because I'm 4 now. I could hardly wait for the photo shoot to be over! It was absolutely fabulous. There was nothing left over. There are fresh bones in the fridge, but SHE said we'd already had too many snacks today. We've NEVER had too many snacks in our opinion. It was MY kind of Special Day!